This Conference is sponsored by the church’s Communications and Public Relations Ministry. 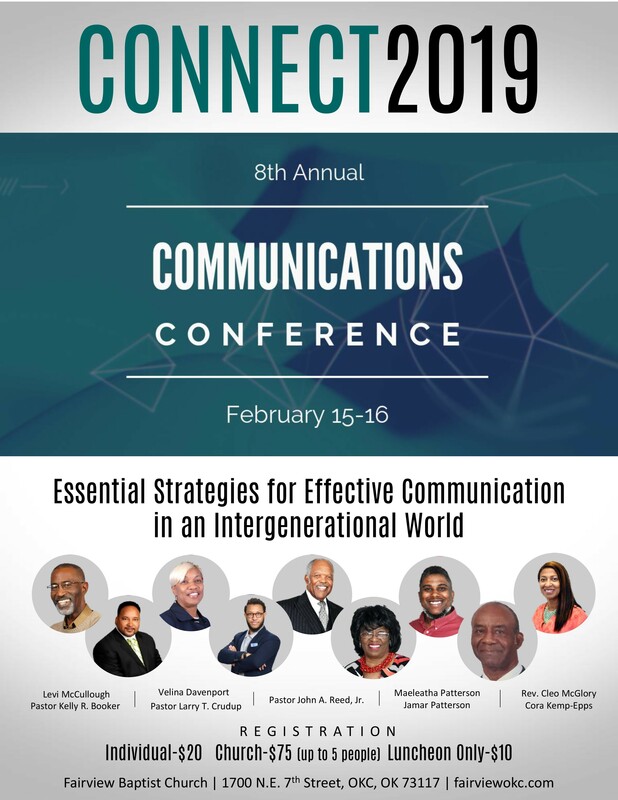 This year's theme is "CONNECT 2019: Essential Strategies for Effective Communication in an Intergenerational World." Church is one of the few places in America where all generations intersect at the same time for the same purpose—to experience God and grow in our faith. But children experience God differently than young adults. And young adults often sound like they’re speaking a foreign language to older adults. Communication across generational lines is a major barrier in all facets of American life, including at church. Topics discussed, concepts and applications presented at this year’s Conference are designed to benefit all of the church, regardless of position, longevity or age. (Pastors and Ministerial Staff, Ministry Leaders and ministry members, Communications/Public Relations Directors and Staff, Church Office Staff, Announcement Clerks, or members seeking their place in the working of church ministry). "Confronting the Fear of Technology,” will be an open-ended format, designed to provide hands-on support in the use of I-Pads, notebooks and tablets, cell phones/smartphones, laptops, basic tips on navigating the computer, digital cameras, etc. Mentors will be available to assist conference attendees in the use of electronic devices in ministry as well as in their personal lives. Information will also be available to introduce participants to varied types of social media. Those with minimal skills or limited knowledge in these areas are encouraged to attend the day session. This session will address some of the challenges faced in multi-generational churches and some of the causes of hesitancies of members to cross generational lines and blend as one body. What’s causing the divide? Language barriers? Promotion Strategies or lack of? Apathy? Complacency among leadership and members? Members of various capacities in the church (Pastors, Communication Staff, laity of various ages) will serve on a panel to address issues presented from the audience in an open forum format. The Conference participants will be able to interact with the panelists as well as participate in Café-style group sessions where they will discuss the challenges experienced in communicating with different generations and its outcome on church ministry. Pastors and leaders, as well as lay members, are encouraged to attend Friday night’s session. The evening will begin at 6:00 p.m. with registration and the Conference will officially open at 6:30 p.m. The session is designed to provide participants with resources and practical techniques and tools to initiate systems and optimize existing processes to promote their church and church ministries. Individual registration is $20 and Church Group Rate of $75 (up to 5 registrants). This includes access to all sessions, including continental breakfast and lunch on Saturday. A special, Luncheon-only rate of $10 is available. You may register online, beginning February 4, with the option to pay online by clicking on the Online Registration link or download and print a Registration Form. Download the Tentative Schedule for a list of offerings with descriptions of sessions.